Need to get HP 2605 replacement cartridges quickly? Check out what Cartridge Save have on offer! Actually finding proper ink tends to be a time-consuming problem, particularly when it requires having to go to or get a hold of various sorts of companies. Regardless, getting your hands on your 2605 print cartridges shouldn't end up being a nerve-wracking experience. Purchase some HP 2605 inkjet cartridges from Cartridge Save. When you make a choice to order bargain HP supplies off Cartridge Save, you can be certain in the fact that your shipment shall be delivered on the next day. All HP 2605 ink supplies at Cartridge Save always are covered with a money-back pledge. If you have got troubles, simply mail us your cartridges for a 100 % refund. Thanks to unreal deals such as these it's impossible not to spend less because of Cartridge Save. Designed with hobby photographers and students in mind, the HP Photosmart 2605 is an all-in-one multifunction machine that offers printing, scanning, copying and faxing in one compact device. The machine uses advanced technology operated via a convenient digital flip-up interface to effortlessly process a variety of documents. It boasts USB, Ethernet and wireless connectivity for users to send and receive documents without being in close proximity to the machine. The innovative HP PhotoREt lll system creates crisp and clear graphics and text at resolutions of up to 1,200 x 1,200 in black and white as well as colour, and 2,400 x 4,800 dpi for scans. The HP Photosmart 2605 also promises decent printing and copying speeds at a maximum of 20 pages per minute in black and white as well as colour. The sleek and desktop-ready HP Photosmart 2605 measures just 21.21 x 46.4 x 37.2cm and weighs only 8.5kg. It boasts paper-handling capacities of up to 150 sheets via the input tray and 50 sheets in the output tray. Most standard paper sizes and weights can be processed via the machine, including labels, plain and photo paper, envelopes and transparency films as well as custom media types between 76 x 127mm and 216 x 356mm. The scanning function comes with an in-built image editor, an integrated optical character recognition package and twain-compliant interface. Similarly, the fax section features a great range of elements, including a 40-speed dial setting, up to 60-page memory and automatic busy redial up to five times. 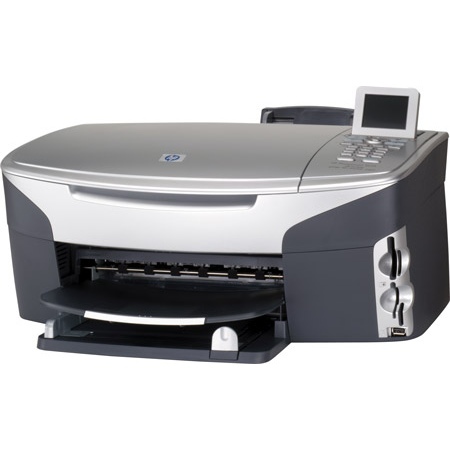 The compact HP Photosmart 2605 features a surprising array of features for its small size, including proficient printing, copying, scanning and faxing functionality. The ability to connect via Ethernet and wirelessly as well via USB port makes the machine more convenient than many of its competitors. The HP Photosmart 2605 has printing speeds that may be too low for consumers wanting to complete larger volume projects. The machine also does not offer any type of two-sided printing feature.